After seven years, there is now a new Mercedes B-Class. The compact van has become visually fresher. Inside there is space and a lot of new technology such as an eight-speed dual-clutch transmission. Compared to its predecessor, the B-Class remains what it has always been: a compact van. However, a front hood with a new contour and a side line freed of drastically rising beads ensure visual freshness. The lowering of the roofline and the wheelbase, which has grown from 2,699 to 2,729 mm, are also doing well. The new headlights shine in the basic equipment with halogen light, for the daytime driving lights are responsible. For an extra charge, there are full-LED headlamps and the already known from the A-Class Multibeam LED headlamps, which adjust the illumination of the respective driving situation. In the rear sit two-part lights with outsourced in the bumper reflectors. The roof spoiler extends laterally to the lower end of the rear window, which benefits the aerodynamics. Compared to its predecessor, the drag coefficient is reduced from 0.25 to 0.24. This should not only be good for a more efficient driving style, but also lower the wind noise level. The driver sits in the new B-Class 90 millimeters higher than in the A-Class. In addition, there is a lowered waistline and optimized roof pillars – this improves the all-round visibility. The screen unit of the MBUX system, also known from the A-Class, is available in three versions: with two seven-inch displays (17.78 centimeters), with a seven- and one 10.25-inch display (26 Centimeters) as well as with two 10.25 inch displays. Optionally, there is a head-up display, which mirrors driving-relevant information in the field of vision of the driver in the windscreen. New to the optional ambient light, which can dive the interior in 64 different colors and ten so-called coordinated color worlds. The seats offer in comparison to the predecessor a larger adjustment range, moreover, they should be more comfortable. The width of the square increases by 33 to 1,456 millimeters – according to Mercedesthis gives middle-class dimensions for the elbow room. At an extra cost, there are seat air conditioning, massage seats and front seats with active seat kinetics for fatigue-free driving. While the backseat of the predecessor was split in a ratio of 40 to 60, a split in the ratio 40 to 20 to 40 series is now possible. From mid-2019, the rear seat can be moved by 14 centimeters in the longitudinal direction if required. 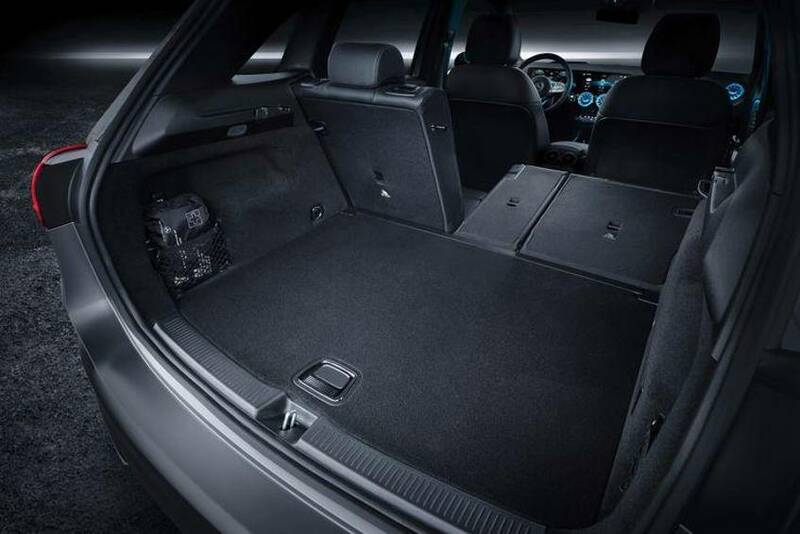 Then also optionally to have: a for loading length recovery folding front passenger seat. A maximum of 1,540 liters of luggage fit into the B-Class, while an electrically opening, closing and gesture-controlled tailgate costs an extra charge. What the new B-Class promises with its new front ends after the A-pillar, because the first impression on the driver’s seat is rather sober. No polarizing colors or shapes, not too many switches. The new B-Class looks pretty emotionless. The seats are comfortable in the state and in their height neatly adjustable, so not only exclusively average driver can cope. Thanks to the height and depth of the adjustable steering wheel, the optimal seating position is quickly found. Besides, a very tall man takes the place of a small woman. Since the slow electrical displacement of the seat ever a lift music before the spiritual ear can sound. The headroom is properly sized in the front two seats. The knees also have enough space and are not in constant contact with the center console. The center armrest is divided into two parts, leather-covered and about 30 centimeters deep and has fold-out cup holders. Particularly pleasing is the fact that the right of the two screens in the center console is a real touchscreen. The infotainment system can thus be operated much easier and above all faster. The space available in the rear is sufficient for this segment. Especially when children are preferably transported from A to B. For these passengers, however, is not the installed in the B-class at the Paris Motor Show white leather. Unlike in the front row, tall passengers in the rear quickly find their headroom limit. The Mercedes-me app collection for the B-Class contains new apps, for example for easier parking search: Other Mercedesse permanently report free parking to a central office, which automatically displays this to drivers in the area in question. In the B-Class different chassis are available . Thus, the customer can choose between the basic suspension , a comfort suspension with lowering and a chassis with active adaptive damper adjustment. At the front axle, all variants feature McPherson struts with forged aluminum wishbones . The stub axles are also made of aluminum , which reduces the unsprung masses. At the rear, a torsion beam axle is used in the entry-level engines. Higher engine ratings are provided by a four-link axle, which in turn is largely made of aluminum . Depending on the equipment, the B-Class driver supports various electronic assistants. So there is an adaptive Abstandstempomaten, an emergency stop wizard and a lane departure assistant. The active Brake Assist is part of the standard equipment: its sensors not only detect the traffic ahead, but also cross traffic with pedestrians and cyclists. For an additional charge Presafe is to have, for example, in an impending accident, the windows closes and harnesses the straps to mitigate possible consequences of an accident. All engines of the new B-Class meet at least the emission standard Euro 6d-temp. The new top-of-the-range engine is the 2.0-liter diesel modified for transverse mounting in power output levels of 150 and 190 hp – this engine already complies with the Euro 6d emissions standard that will only apply from the beginning of 2020. The well-known from the A-Class 1.5-liter diesel with 116 hp rounds off the range of diesels down. To launch the market, the customer can also choose from two gasoline: The unit with 1.33 liters of displacement makes either 136 or 163 hp. Both engines are equipped with a cylinder deactivation and a gasoline particulate filter. Further engines are announced for a later time, this could count for the first time also a genuine AMG variant. The fuel is carried in a 43-liter tank, a 51-liter tank costs extra. 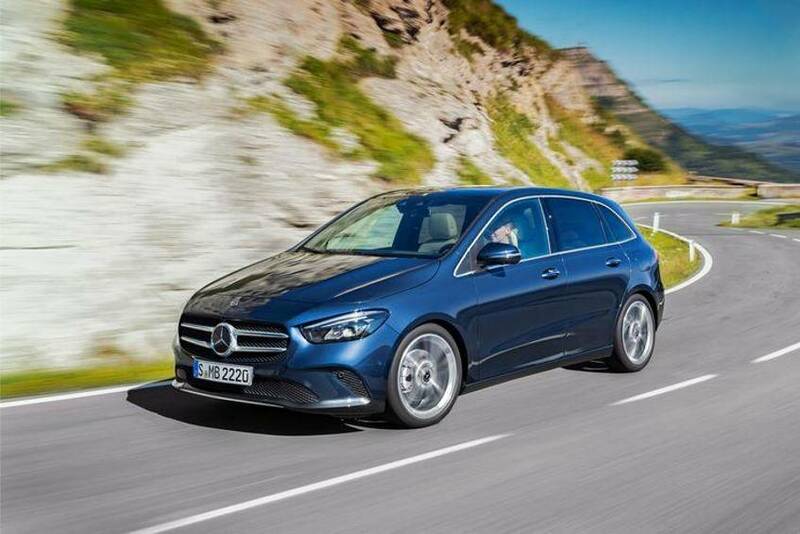 All B-Class models are equipped with a double-clutch transmission (DCT), the variants with the new Top-Diesel receive an eight-speed DKG developed by Mercedes , while the other units are connected to seven-speed DCGs. Six-speed manual transmissions will be available at a later date. The new B-Class can be ordered from 3 December 2018. Deliveries begin in February 2019. The B 180 is priced at € 31,874 and the B 200 is at least € 33,570. Cheapest diesel is the B 200 d at prices from 35,932 euros. The B 220 d is in the price list with a base price of 39.264 euros. Inside, the B-Class is big – much bigger than it looks from the outside. There is plenty of room for the legs both at the front and at the back. In the back, one could even push the feet loosely under the front seat, even if they were in ski boots. And even over the head, sitting giants in the front and back are happy about a lot of air, even if the glass roof divided between the front and the back is built in. The rear seatback can now be folded down in a ratio of 40 to 20 to 40, before the division was still 40 to 60. The upright, high, but comfortable seating position takes over the B-Class from its predecessor. In combination with the steep windshield and the low dashboard results in a gigantic field of vision forward. In addition, the system works with an exemplary working voice control: “Drive me to X / Y” understands the Navi, for example, in spite of background noise right away and then calculated lightning fast the route. Already known from the A-Class and now also in the B-Class: a real head-up display that reflects driving-relevant information in the driver’s field of vision in the windscreen. Also optional for the first time in the B-Class: an audio system by the Berlin-based audio specialist Burmester. His employees travel to Sindelfingen with great ambition and will not return until their high demands on audio quality are met, as Jochen Eck, seated at the wheel, tells us at Mercedes Head of Complete Vehicle Testing Compact Cars. Ambient lighting, which can be changed in many colors, can now make the interior more atmospheric and new insets in the dashboard create a modern touch. In our case, a carbon insert made wide, which belongs together with the bottom flattened steering wheel to the AMG line. 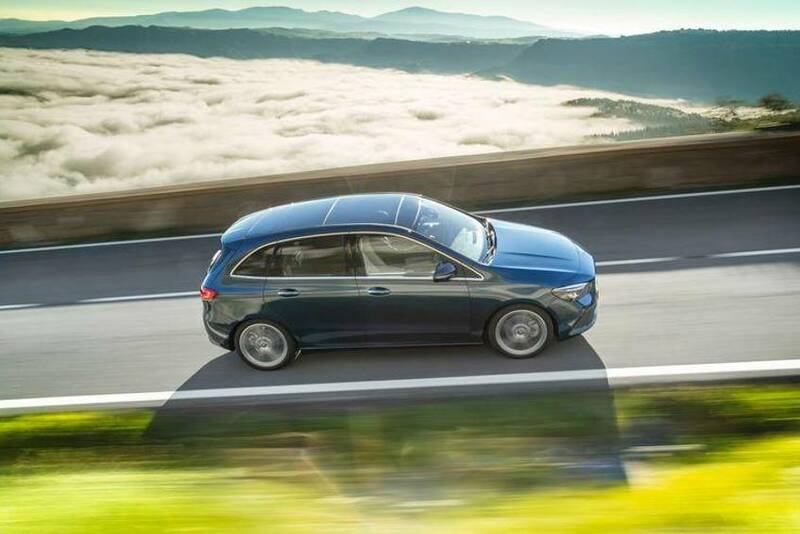 The chassis of the new B-Class achieves a balanced balancing act between comfort and dynamics. Even evil potholes take the horror, the audible rumble sounds like more than actually arrive in the back of the inmates. The price for comfort is tender side slope in curves. In the stand, the new top diesel nails audibly, while driving the noise disappears, with the noise level in the B-class is already very low anyway. Thanks to powerful torque, the B-Class sprints light-footed. An alternative to the diesels could be a B 220e (plug-in hybrid) with 13.7 kWh battery and about 70 kilometers of electric range. When asked if this time will be a real AMG version and again a pure electric version, you would not say anything at Mercedes – a clear “No” sounds different. As the first power model of the compact family comes in the fall of 2019, the AMG A35 come with the two-liter four-cylinder (M260), 48-volt electrical system and belt starter generator (RSG). 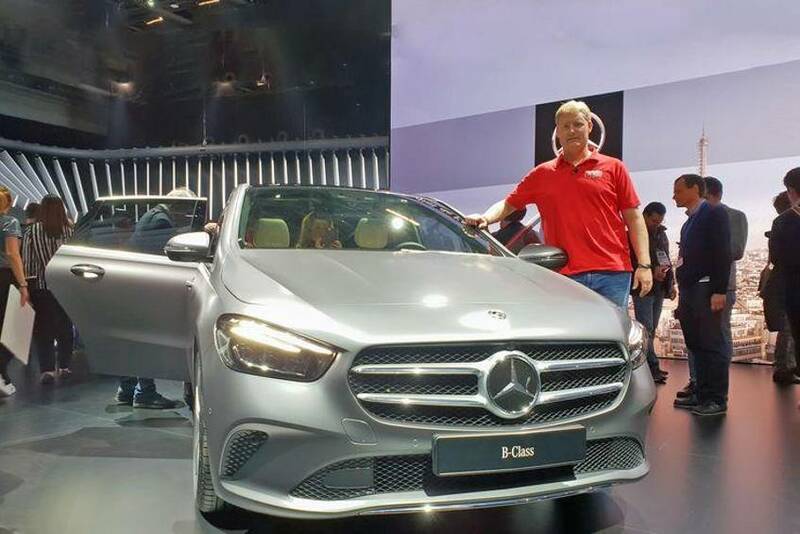 The system performance is 305 hp – that would be something for the B-Class, performance sells, according to Mr. Eck still good. To divide the gears of the big diesel appropriately, Mercedes hasspecially developed a new dual-clutch transmission (DKG) – one with eight gears. And it’s not as if the B-Class had previously suffered from a lack of gearboxes: So far, a six-speed manual transmission, a seven-speed DKG from Getrag and a group-owned seven-speed DC were available – for other model series also has Daimler nor the self-developed Neungang automatic in the program. Why this diversity? The perfect gearbox for every engine is the answer of the engineers. The eight-speed DC would simply be too much for the small engines, with their respective seven- or six-speed gearbox, they work more efficiently and the vehicle weight also drops. The combination of the largest B-class diesel and eight-speed DCGs has been coordinated by the engineers: No jerking at the start, no moaning without significant passage when accelerating – the new drive package fits. And it has to be: After all, the B-Class is a spacious compact car among the best-selling models of the Group.